Every cell in our body has the intelligence to heal that is often disrupted by environmental, emotional, nutritional, and genetic factors. Ayurveda is focused with creating an ideal environment for each cell to function in the most harmonius way that supports the body to heal itself. Ayurveda focuses on removing the underlying cause of symptoms, restoring balance and increasing awareness using safe herbs, healthy eating habits, cleansing or rejuvenating therapies, and establishing daily routines that will strengthen the body, mind, and consciousness. Since Ayurveda considers food to be medicine, it first focuses on diet and lifestyle as the foundation for good health, allowing you to take more control over your health and well being. Along with this, herbs, essential oils, breathing techniques, yoga, meditation and body therapies will be used according to their properties and benefits in restoring balance to the body and mind. Only the highest quality and safe herbs that are organic and FDA approved will be used. As with any type of health care, it is important to have the guidance and close supervision of a trained clinician through regular follow-ups and good communication. Ayurveda is a very effective system of alternative medicine that is slowly being recognized in the West. It is one if the primary systems of health care in India, and has been used for thousands of years Research shows encouraging results for the Ayurvedic management of common ailments and many chronic and degenerative diseases, This body of research covers a wide range of disorders, from common ailments such as indigestion, constipation, allergies, skin problems, to chronic disorders such as diabetes, thyroid disease, arthritis and depression to name a few. Ayurveda does need commitment and its full effectiveness will depend on various considerations, including your age and state of health, how much effort you are willing to put into making the necessary changes toward better health, and how disciplined you are with taking your formulas and following the recommended guidelines. Since treatment is very individualized, its results will depend on individual factors and on follow-up treatments and adjustments and close supervision are absolutely necessary to obtain optimal results. It really depends on what your health state, age, lifestyle, and goals are. Ayurveda defines imbalance as the end result of living out of harmony with your original constitution. Since we all have a different balance of energy, the path to optimal health will vary from person to person. Ayurveda is practical and can be flexible, but you are responsible for achieving the results you want through common sense and discipline. Keep in mind it is what we do most of the time that helps or hinders the body’s ability to stay healthy so with regular follow up, there will be a greater success in implementing changes and making choices that are harmonious most of the time. That would depend on your particular state of health, your lifestyle, and how disciplined you are in following the treatment plan. Ayurveda is a holistic system and herbs act more gently and synergistically, patience and self-effort are important. As far as diet and lifestyle changes are concerned, slow change is lasting change, since trying to make radical changes all at once can often times become overwhelming. Remember that true healing is a journey of greater awareness and inner transformation, this cannot be hurried. Can Ayurveda help with me with acute ailments and first aid? Yes. Ayurveda offers many practical and simple treatments for acute and first aid ailments with medicinal substances you may even be able to find in your own kitchen. Most people are amazed at how simple preventing and treating common ailments can be with a basic Ayurvedic knowledge. As you continue on your journey to optimal health with Ayurveda, you will learn how to integrate a 'kitchen pharmacy' into your lifestyle. Ayurveda can be used in conjunction with Western allopathic medicine. Drugs can save lives, but because of their toxicity they can also weaken or damage the body. Ayurveda can help protect and make the body stronger after or along with drugs or surgery. Before designing any custom herbal formulas, whatever prescriptions you are taking will be taken into consideration and any drug/herb interactions will be explored. You will continue to take your medical prescription under the guidance of your physician. How long do I have to take the herbs? 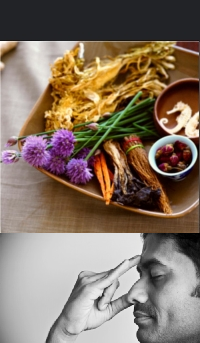 It is difficult to predict how long one needs to take herbs and so many other lifestyle factors have to be considered, however herbs are meant to be temporary and necessary only until the doshas get back into balance and you have created the right environment for the body to get all that it needs to heal itself. If you are incorporating supportive habits then it can take a month for every year of having an illness for the body to get back into balance. So that gives you an idea of how long you may be on these herbs. Keep in mind the herbs in your specific formula are very safe and of the best quality approved by fda and certified organic and taken over long term will act as rasayana - anti aging and immune boosting. So do remember to take them consistently and keep up with the other practice. Can I lose weight with Ayurveda? Ayurveda has a very effective approach to managing your weight while promoting good health and overall well being. Because of its understanding of the qualities of food and their affect on your specific constitution, Ayurveda can help you decide what foods will be most appropriate for you and which ones to generally avoid. In Ayurveda, weight loss or gain is not about counting calories. It is about bringing harmony back into the way you eat your food and live your life. It is about bringing awareness to your constitution, your lifestyle, your habits and your health.